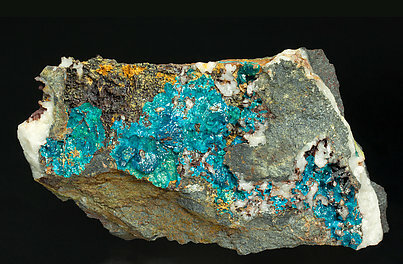 Aggregates of Caledonite crystals with a color between clear blue, slightly greenish and deep green. 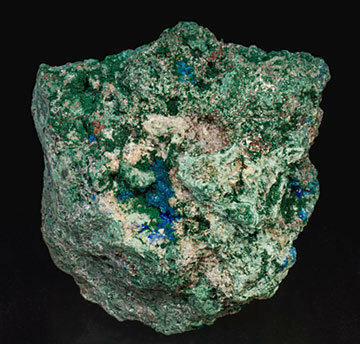 They have a dipyramidal shape with very well defined faces and edges, and they are on matrix, with deep blue Linarite crystals and small Chlorargyrite (variety embolite) crystals. An American classic from the R.W. Thomssen collection, whose label we’ll send to the buyer. Single thin crystals and flattened parallel and skeletal Caledonite growths. 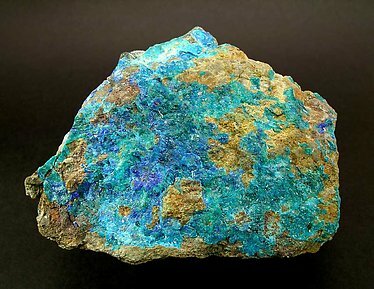 They are translucent and very bright, have a very intense and vivid blue color and are on a rocky matrix with Quartz. A great American classic, more esthetic than usual.